Daniel A. Hagen, 68, of DeKalb Junction, died on April 14, 2019, at Canton Potsdam Hospital. There will be a Celebration of Life on Friday April 19th, 5 – 8 PM at AMVETS Post 11, DeKalb Junction. Daniel is survived by his son Jeremy and his wife Calely Hagen of Milford, CT, his brothers, Gary and his wife Linda Hagen of Hammond, Donald and his wife Melanie Hagen of Evans Mills, a granddaughter, Zoey Hagen, several nieces and nephews. Dan was born on January 9, 1951, in Watertown, the son of the late, Manford and Mildred Moyer Hagen. Daniel was a millwright machinist at Corning Inc., he retired in 2007. Daniel was a member of the United Steel Workers of America, and AMVETS Post 11. 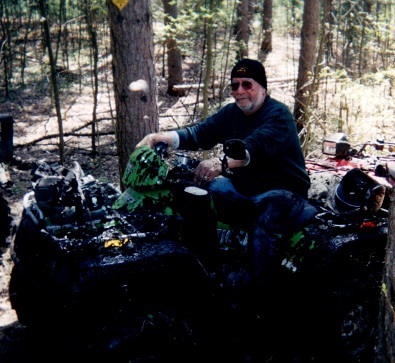 He enjoyed, hunting, riding motorcycles and ATVs. In lieu of flowers, contributions can be made to the St. Lawrence County SPCA. I was saddened to learn that Dan has passed away. We worked together at Corning and we were friends. My condolences to the family. I will remember Dan with fondness. May he rest in peace. Dam it, Hagan, too soon! ALLWAYS remembered good times when we rode together. Cliff will be waiting bro.” RIDE FREE FOREVER. You were a good neighbor and friend during the nine years I lived next door Dan……yours was often a generous and kind soul…your most important legacy is a wonderful son and his family ……may be you be happy and at peace with all those family and friends who passed before you…..until we see one another again! Jeremy & Family, It’s been years since I’ve seen your father, but we spent a good part of our younger years together. I remember as kids playing with toy trucks in the dirt on your grandparents farm, times Sixberry Lake, and Campbell’s Point. Dan was one of the funniest people I ever knew and everything was an adventure! Things will be a lot livelier up there with Dan Hagen around! Your father was a part of my life that I’ll remember always. My deepest sympathy!